Dave and I just got our first holiday card in the mail last week (it was a Thanksgiving card) and I know Christmas and New Year’s cards will be making their way into our mailbox soon enough. As I’ve mentioned before, I really enjoy the whole process of sending out holiday cards — and of course, I love receiving holiday cards from other too. However, there is always the question of what to do with all those cards AFTER the holiday season is over. 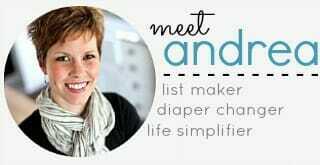 I personally don’t want extra paper ‘clutter’ in my home, but at the same time, I often feel guilty throwing out cute pictures and thoughtful holiday cards. 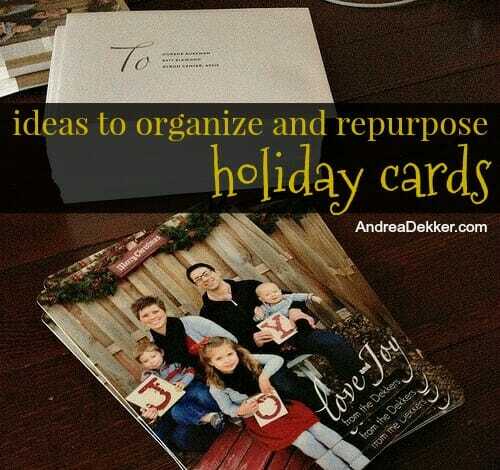 If you can relate, I hope today’s post offers a few ideas to help you organize and repurpose your old holiday cards! Ever since Dave and I have been married, I’ve saved one copy of each Christmas/New Year’s/Holiday card I sent out. I keep them filed in our filing cabinet. I also take pictures of the fronts and backs of the cards and put them into our yearly digital photo albums. I definitely don’t think it’s necessary to keep a copy of your own family’s cards each year, but our kids do really like looking back at the old photos, and I like being able to quickly reference old designs and layouts I used. 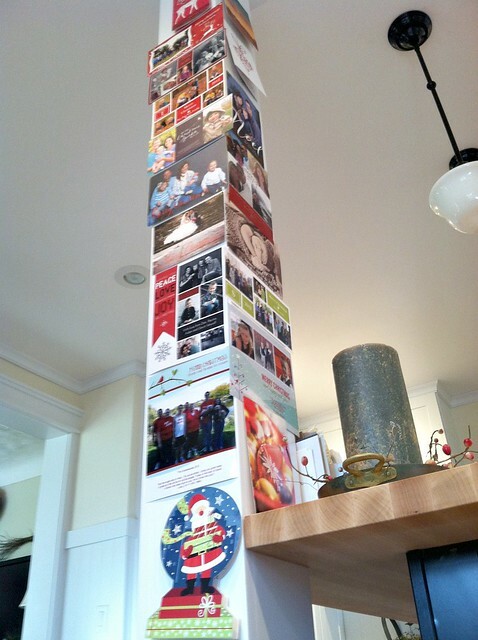 We LOOOOOVE getting holiday cards in the mail… and we display them all on the large white post in the middle of our kitchen. 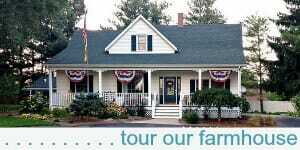 It’s the PERFECT spot to display our cards because we see them all season long, all our guests can look through them, and our friends and family get to see their cards on display whenever they come over. Eventually, we take the cards down and make a big pile. We look through them together one last time, and then I let Nora (and now Simon) practice cutting out all the individual people and pictures on each card. They thoroughly enjoy this process and often save some of the pictures of their cousins or friends. Then we recycle the “scraps”. I know this might seem a bit wasteful, but I promise, we really DO enjoy the cards all season long — I just don’t want to keep them forever! That said, I don’t think it’s the worst use of space to hold onto old holiday cards, especially if you’re more of a sentimental person. 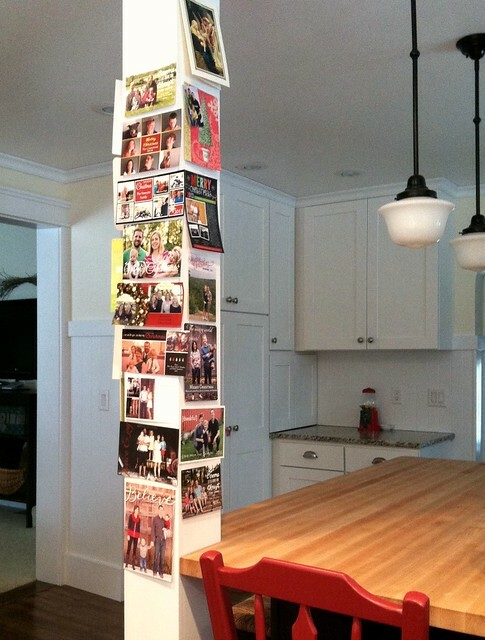 Take pictures of all your holiday cards (or scan them in) and incorporate them into a digital photo book. Punch a hole in the cards, put them on a ring, and label each ring by year. Then get out all your cards every holiday season and have fun looking back on past years’ cards. Put all the cards in a large basket/box/container, pull one card out every day (or every week), and pray for that person, family, or organization. String them together to form a “Christmas Card Garland” and hang it around a doorframe, your fireplace mantle, or up a stair banister. Cut out individual pictures from photo cards and use them as gift tags (so you know who each gift is for). I’m sure there are SO many other ways to organize and repurpose old cards — and I’d love it if you shared any of your ideas in the comments! What do you do with your old cards? Once Christmas is over, I put all the cards and holiday letters we receive in a basket which is kept near our kitchen table. Every morning at breakfast I pull one card out of the basket. The person/family who sent that card is someone I intentionally pray for that day – all day- kind of like the “person of the day”. At the end of the day, that card goes to the back of the basket. When I have cycled through praying for every sender, I recycle the cards by making origami boxes or cutting some of the pictures out for other crafts and then ultimately recycle all the left over paper scraps at our local recycling center. This is fabulous Margaret — thanks so much for sharing! I might just have to share your comment on my Facebook wall as it’s very timely! One thing we try to do is keep the cards after Christmas in a basket. Each day or two we pull out a card and throughout the day our whole family prays for the person/family who sent the card. It is a little way to think about the person who sent the card after the Christmas holidays are over. Scrapbook. That’s the only scrapbooking (if you can call it that) I do all year. I write the year at the top of the page and we’ve fit 6+ years in one book! I bring it out along with our Christmas books and my children love looking through it. And since I only have the pics, it saves a ton of space. 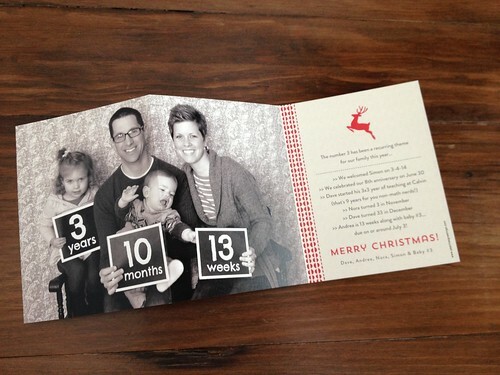 PS – do you order your Christmas cards the same way you do your announcements? I have done Costco cards and they’re a great price but always looking for other options. I often do Christmas cards the same way (through VistaPrint) but sometimes, I get credit or gift cards to places like TinyPrints or Minted, so then I order through them. 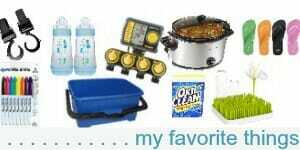 They aren’t as frugal, but if I have credit or gift cards, they are free!! Thanks Andrea, and readers, for the great ideas! My mom always made gift tags out of old cards, but I’ve been looking for other options too. I like the gift card holder idea, and keeping photo cards in a special holiday album. One way of recycling cards is to send them to St. Jude’s Children’s hospital, where they reuse them for children to make new cards. I didn’t know about St. Jude’s using the cards for making new cards, but there are other places that do- my Grandma’s assisted-living place collected all kinds of cards year-round and they did crafts and card-making projects to raise money for special outings. Recently I learned on a NextDoor site (local social media thing) about a homebound senior who wants cards and other paper stuff for his craft hobby, so that’s easy since we can just drop them off. But if you have to dispose of them, PLEASE recycle- paper does not belong in the landfill. We display all the cards we receive during the holiday season. I use a card basket as one of my Christmas decor and put all cards in there. It’s fun to look at them throughout the season. I used to save the holiday photo cards I received from friends and after a while they piled up. I now only save the cards that I know I’ll be using for next year’s gift tags. So many holiday cards have pretty covers, sayings, etc. I cut those out and paste them on the gift as an additional embellishment since I use butcher block paper for wrapping our gifts. I also cut out the faces of family from their holiday card and paste them on next year’s gift tags. Gift wrapping is probably the only time of the year that I do much crafting. It’s pretty fun and a great way to recycle those cards. yes, we know lots of people who have a holiday card basket!! Over the summer I cleaned out all the old Christmas cards we’d been saving for 28 years! I saved only the photo cards or holiday photos from close friends and family. I wrote the year in the back of each and placed each family’s photos in a page protector in a binder. 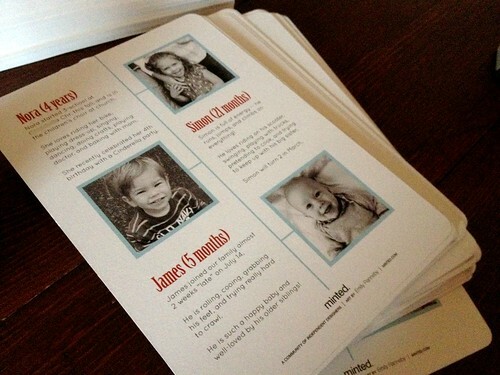 I now have a cute reminder I can flip through and see the kids as they grew up. One binder is much better than the rubber banded together piles of cards I had filling two file cabinet drawers. wow — THAT is a lot of cards! Good for you for clearing them out! I love repurposing Christmas cards. The cards have such beautiful images and I like giving those beautiful images a second life. I’ve shared tutorials on upcycling Christmas cards to make gift tags, to decorate matchboxes, to make gift card sleeves and more. great idea with the gift card sleeve! Andrea, what a great idea to scan them all or take pictures. This would be a great way to have a back up of all of them in case one got lost or misplaced. I recently heard a pastor say that they keep the Christmas cards they’ve received at the holidays as a way to pray for their friends through the year. They keep them stacked and held together w a rubber band and take one out at dinner time. We are going to try it with our kids this year. yes! We know lots of people who use their cards as prayer reminders! 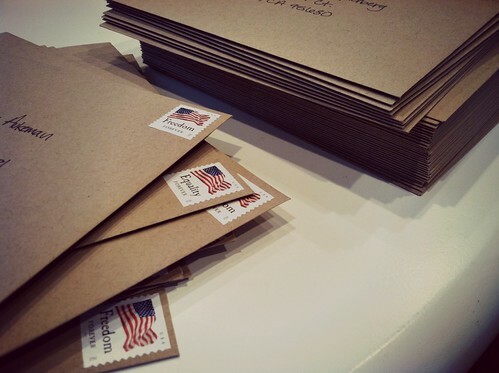 Much like you, I enjoy the process of sending holiday cards. I even look forward to purchasing the special seasonal stamps! We display them on our chicken wire frame & when mid January comes I recycle almost all of them. 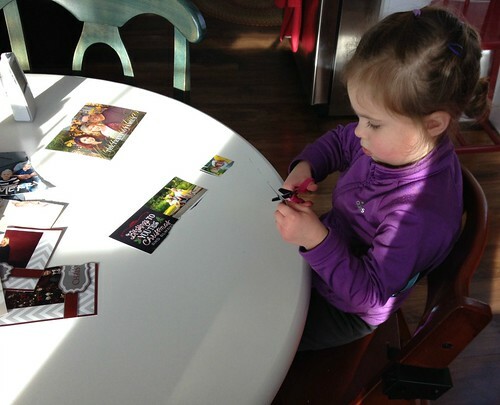 The few keepers are immediate family member photos (usually just one or two send a photo) & the one or two cards that have heartfelt letters to us written inside. Within the last year I went through all the birthday & Valentine’s Day cards we had been stashing (hoarding… ha!) & recycled all of the ones that were only signed with no message inside. After the new year I need to further pare down that stack into my absolute must keeps. Thanks for inspiring as usual! good for you! I know there are lots of sentimental people out there who really do enjoy saving all the cards — but there comes a point when you just have to much! Hope you enjoy the extra space!